Copyright: © 2012 Sawyer AM, et al. This is an open-access article distributed under the terms of the Creative Commons Attribution License, which permits unrestricted use, distribution, and reproduction in any medium, provided the original author and source are credited. practice can significantly reduce pain and increase functional ability in chronic low back pain patients. It is estimated that 70% of people will experience low back pain at some point in their lives, and recurrence rates can be as high as 85% [1,2]. In addition to causing general discomfort, chronic low back pain may interfere with activities of daily living by reducing mobility, hindering work duties, and negatively impacting self-care . These functional deficits can have adverse psychological and emotional consequences as well . Despite a wide variety of treatment options, chronic low back pain can be difficult and costly to treat, and 17% of U.S. adults turn to some form of complementary and alternative medicine to address their back pain [5-8]. Yoga is form of complementary and alternative medicine that encompasses a variety of practices, including physical postures (asanas), breathing exercises (pranayama), and meditation . The popularity of yoga has increased steadily over the past decade, with roughly 6% of U.S. adults practicing yoga as of 2007 [8,9]. It is estimated that the number of current yoga practitioners in the U.S. may be as high as 20 million . Recent research suggests that yoga may relieve back pain and reduce functional disability associated with back pain [11,12]. However, these studies have demonstrated mixed results, due in part to inadequate statistical power and variation among studies in the outcome measures used. The objective of this study was to determine, using a rigorous systematic review and meta-analysis, the impact of yoga on pain and disability related to chronic low back disorders. We reviewed the research literature to identify studies of the effects of yoga on pain and functional limitation in patients with chronic low back pain. Our literature search began April 2011 and continued through October 2011. Cochrane, PubMed, CINAHL, Embase, ProQuest Dissertations and Theses, Google Scholar, and Clinicaltrials. gov databases were searched electronically. The search terms used were: yoga AND back pain. Reference lists from 13 fully-evaluated articles were also examined for studies not found through online database searches. Studies meeting the following criteria were considered for review: 1) study participants reported having pain in the lower back region lasting at least three months in duration and/or had visited a primary care provider for treatment of back pain in the 3 to 18 months before the study, 2) the study contained at least two separate groups of subjects with chronic low back pain which were randomly assigned either to a group that practiced yoga or a group that served as a comparison control, and 3) the study measured pain and/or pain-related functional outcomes. Studies were excluded for the following reasons: 1) subjects were less than 18 years old, 2) subjects did not report chronic low back pain, 3) subjects had serious spinal or neurologic pathology (including stenosis, tumor, or active infection), 4) subjects were pregnant, and 5) studies had a rating of 4 out of 11 or lower on the PEDro Quality Assessment Tool . A total of 58 relevant studies were originally identified through the database searches. Of those, 45 were excluded on the basis of the title and/or review of the abstract. At this point, 13 studies were fully evaluated via a careful review of the full text. On the basis of the inclusion and exclusion criteria, 6 studies were excluded, leaving a total of 7 studies to be included in the meta-analyses (Table 1) [14-20]. For the meta-analyses, pain and functional outcome data were extracted from three studies in the forms of means, Standard Deviations (SD), and samples sizes (n) for both the yoga and control group [16,18,19]. One study reported means, n, and Standard Errors of the Mean (SEM), which were converted to SD . Three studies did not report means or SD, so the mean change score, p values, and n were extracted [15,17,20]. The extracted pain and functional limitation data were converted to a standard format by calculating the standardized mean difference, which will be referred to as an Effect Size (ES) from this point on. Metaanalyses were run using a random-effects model that accounts for true interstudy variation in effects as well as random error within each study . A random-effects model was chosen over the fixed-effect model because of the variation in experimental factors (e.g. type of control comparison, hours of yoga practiced, how pain and functional outcomes were measured, study length) used in the seven studies. In the study with more than one control group (yoga vs. exercise and yoga vs. self-care book) being evaluated, an ES was calculated for each factor and was treated as if it originated from an independent study . Meta-analyses were conducted using Comprehensive Meta- Analysis software (Version 2.2; Biostat Inc., Englewood, NJ). An α level of 0.05 was used in all analyses. ES values of 0.2, 0.5, and 0.8 were considered to be small, moderate, and large, respectively . The effect of publication bias on the meta-analyses was addressed by combining a funnel plot assessment with the Duval and Tweedie’s trim and fill correction. This is a preferred method for assessing the extent of publication bias as well as for making a correction to the overall ES . In total, six studies were included for meta-analysis of yoga’s effect on low back pain and seven studies were included for meta-analysis of yoga’s effect on functional ability as related to low back pain. The characteristics of those investigations are summarized in Table 1. All seven studies were published in peer-reviewed journals and used a randomized control trial design. In two studies the control group took part in conventional exercise [16,17]; other control groups received written advice on back care and/or standard medical care (Table 1). One study included two control groups, one of which participated in conventional exercise and the other of which received a self-help book . Six of the studies reported some form of pain outcome measure [14-18,20], while all seven studies [14-20] included a measure of functional disability as related to low back pain. These measures were ones reported at pre-treatment, immediately post-treatment, and/or at follow up at 12, 14, and 24 weeks post-treatment. Four studies made follow-up assessments ranging from 12 to 24 weeks post intervention [14,15,17,18]. Three of the seven studies [16,19,20] only provided preand post-treatment measures and did not include a follow up. A total of 403 subjects were used in the seven studies. The median subject number per study was 58, and subject gender was a mixture of males and females in all studies. Subject age ranged from 18 to 67 years old, with the average participant in his/her mid-late 40’s. The duration of the yoga intervention varied greatly among the studies, ranging from a daily, one-week intensive course to 24 weeks of twice-weekly practice. In order to standardize the intervention data, the total number of yoga hours was calculated by multiplying the number of hours of yoga per week by the number of weeks of the intervention (Table 1). Total yoga hours ranged from 12 to 78 hours, with an average of 24 hours. Five of the studies scored at least 7 out of 11 on the PEDro scale. Table 1: Characteristics of the 7 studies examining the effects of yoga on low back pain or functional disability. All six studies that included a pain outcome measure exhibited positive effects of yoga compared to control (Figure 1A). Metaanalysis of the six studies yielded a statistically significant and medium overall ES for pain, indicating that subjects practicing yoga reported significantly less pain than control subjects (overall ES = 0.58, p<0.001). This equates to at least an eighteen point reduction on a 100-point visual analog scale . There was no single study that dominated the overall ES. Publication bias was assessed by examining a funnel plot of standard error versus study ES. No asymmetry was noted in the plot. Furthermore, the overall ES remained unchanged after application of the Duval and Tweedie’s trim and fill correction. The ratio of true between-study variance to total variance was found to be nonexistent for this outcome measure as indicated by I² equaling zero (p=0.72). Finally, the reduction in pain for yoga subjects remained statistically significant 12-24 weeks after the end of the intervention. Meta-analysis of the four studies that included follow-up data yielded a statistically significant and medium ES for pain that favored the yoga group (overall ES = 0.54, p<0.001). Overall, yoga subjects also reported significantly improved functional ability as a result of the intervention (overall ES = 0.53, p<0.001; Figure 1B). This equates approximately to a two or three point reduction on the Roland Morris Disability Scale or a ten point reduction on the Oswestry Disability Index . As for the pain outcomes, there was no single study that dominated the overall ES and no asymmetry was noted in a funnel plot of standard error versus study ES. The overall ES was also not affected after application of the Duval and Tweedie’s trim and fill correction. The ratio of true between-study variance to total variance was found to be low to moderate (I²=36%, p=0.15). Meta-analysis of the four studies that included follow-up data 12-24 weeks after intervention yielded a statistically significant and medium overall ES that favored the yoga group (overall ES = 0.44, p=0.002). 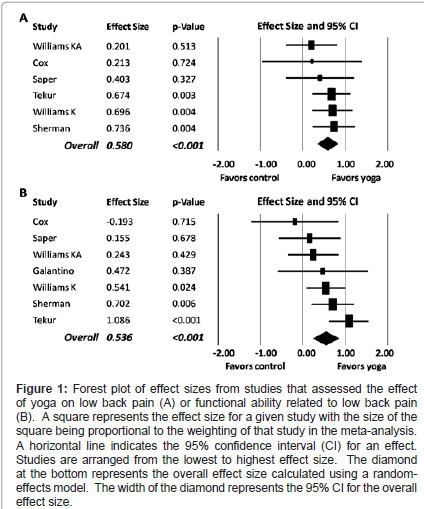 Figure 1: Forest plot of effect sizes from studies that assessed the effect of yoga on low back pain (A) or functional ability related to low back pain (B). A square represents the effect size for a given study with the size of the square being proportional to the weighting of that study in the meta-analysis. A horizontal line indicates the 95% confidence interval (CI) for an effect. Studies are arranged from the lowest to highest effect size. The diamond at the bottom represents the overall effect size calculated using a randomeffects model. The width of the diamond represents the 95% CI for the overall effect size. The main finding of this study suggests that the practice of yoga can decrease pain and increase functional ability in patients with chronic low back pain. Given these findings, yoga maybe considered an effective treatment for individuals with chronic low back pain that are seeking non-surgical intervention. In addition to stretching and strengthening the muscles of the back and lower extremities through physical postures, yoga may have the additional benefit of reducing stress through meditation and breathing exercises, contributing to an overall reduction in symptoms for individuals with low back pain. There are several potential limitations of our systematic review and meta-analysis, as well as some methodological concerns with the underlying studies themselves. One possible limitation of our systematic review is publication bias. Publication bias occurs when published research is systematically unrepresentative of the total population of studies . Studies with non-significant and/or negative findings are less likely to be published, and this may inflate the overall ES in a meta-analysis that is based largely on published studies. Though we identified one doctoral dissertation in our systematic review (which has subsequently been published), the study was not a randomized controlled trial, and so was not included in our analysis . There is no evidence of publication bias occurring in our meta-analyses. There was no asymmetry noted in the funnel plot and the overall ESs were not affected by the Duval and Tweedie’s trim and fill correction. A second potential limitation of our analysis was the inability to explain the heterogeneity in the meta-analysis on functional ability outcomes (I²=36%, p=0.15). Sub-group meta-analyses that examine ES based on type of control treatment (education or exercise) or total number of hours of yoga practice may help account for this variance, but given the small number of studies in our meta-analyses we were unable to probe the effects of potential moderator variables. Several other experimental factors may help explain the betweenstudy variation in study ES. Though all seven studies used yoga postures as the intervention, there was some variability among studies in the postures that were utilized. Of the seven studies included in this analysis, six provided either written or pictorial descriptions of the yoga postures used in the intervention [14-19]. Two studies excluded backward-bending postures [14,18], while the other five included these exercises [15-17,19,20]. It is also unclear how many repetitions of each posture were performed and/or the length of time spent in a posture. These are all variables that may impact the outcome measures of pain and function. Another source of variability among studies was the instruction of the yoga intervention. In some cases one instructor taught all of the yoga classes [17,19], while in other studies there were multiple instructors [14-16,18,20]. Though all classes were taught by certified yoga instructors, they represented a variety of different yoga traditions (including Iyengar, viniyoga, and general Hatha yoga) and varied in terms of their teaching background and experience. This introduces an additional source of variance and makes it more difficult to exactly replicate the yoga interventions. Methodological issues within the studies themselves are also a potential limitation of this analysis. None of the seven included studies blinded the subjects and therapists. According to PEDro criteria, subjects and therapists are considered to be “blind” only if they are unable to distinguish between the treatments applied to different groups . However, given that the therapists that administered the intervention are yoga teachers and are employing yoga postures as the intervention, it would be virtually impossible to satisfy these criteria in studies of this nature. Lack of allocation concealment increases the source of bias in three of the studies [18-20]. Another concern is the low completion rate for these studies. Only two of the seven studies collected complete data from more than 85% of the subjects that were initially allocated to groups [16,17]. Given that initial sample sizes were small (thirty or fewer participants) for three of these studies [15,19,20], a high drop-out rate further increases the risk of bias. This study provides justification for future research. Future research studies would benefit from clearly described allocation concealment and blinding procedures, as well as larger sample sizes and higher completion rates. It may also be helpful to identify a clear set of yoga postures, including specific variations and modifications, to form the basis of a replicable low back care protocol. This would help ensure that yoga interventions are taught more uniformly regardless of the specific yoga tradition and background of the instructor. Yoga may affect participants through both physical and mental means, and current research does not demonstrate how these may intertwine to affect low back pain. Only two studies in the current analysis included range of motion measurements [16,18], and the inclusion of this and other objective measures in future studies may help determine the mechanism(s) by which yoga decreases pain and increases function. It is also unclear how cost-effective yoga may be as compared to other forms of conservative treatment. Lawrence RC, Helmick CG, Arnett FC, Deyo RA, Felson DT, et al. (1998) Estimates of the prevalence of arthritis and selected musculoskeletal disorder in the United States. Arthritis Rheum 41: 778-799. Hides JA, Jull GA, Richardson CA (2001) Long-term effects of specific stabilizing exercises for first-episode low back pain. Spine (Phila Pa 1976) 26: 243-248. Hammill RR, Beazell JR, Hart JM (2008) Neuromuscular consequences of low back pain and core dysfunction. Clin Sports Med 27: 449-462. Pincus T, Burton AK, Vogel S, Field AP (2002) A systematic review of psychological factors as predictors or chronicity/disability in prospective cohorts of low back pain. Spine (Phila Pa 1976) 27:109-120. Luo X, Pietrobon R, Sun SX, Liu GG, Hey L (2004) Estimates and patterns of direct health care expenditures among individuals with back pain in the United States. Spine 29: 79-86. Pradhan BB (2008) Evidence-informed management of chronic low back pain with watchful waiting. Spine 8: 253-257. Haldeman S, Dagenais S (2008) What have we learned about the evidence-informed management of chronic low back pain? Spine (Phila Pa 1976) 8: 266-277. Tindle HA, Davis RB, Phillips RS, Eisenberg DM (2005) Trends in use of complementary and alternative medicine by US adults: 1997-2002. Altern Ther Health Med 11: 42-49. Broad WJ (2012) How yoga can wreck your body. New York Times. January 5. Chou R, Huffman LH (2007) Nonpharmacologic therapies for acute and chronic low back pain: a review of evidence for an American Pain Society/American College of Physicians clinical practice guideline. Ann Intern Med 147: 492-504. Posadzki P, Ernst E (2011) Yoga for low back pain: a systematic review of randomized clinical trials. Clin Rheumatol 30: 1257-1262. Maher CG, Sherrington C, Herbert RD, Moseley AM, Elkins M (2003) Reliability of the PEDro scale for rating quality of randomized controlled trials. Phys Ther 83: 713-721. Williams K, Abildso C, Steinberg L, Doyle E, Epstein B, et al. (2009) Evaluation of the effectiveness and efficacy of Iyengar yoga therapy on chronic low back pain. Spine (Phila Pa 1976) 34: 2066-2076. Saper RB, Sherman KJ, Cullum-Dugan D, Davis RB, Phillips RS, et al. (2009) Yoga for chronic low back pain in a predominantly minority population: a pilot randomized controlled trial. Altern Ther Health Med 15:18-27. Tekur P, Singphow C, Nagendra HR, Raghuram N (2008) Effect of short-term intensive yoga program on pain, functional disability, and spinal flexibility in chronic low back pain: a randomized control study. J Altern Complement Med 14:637-644. Sherman KJ, Cherkin DC, Erro J, Miglioretti DL, Deyo RA (2005) Comparing yoga, exercise and a self-care book for chronic low back pain – a randomized, controlled trial. Ann Intern Med 143:849-856. Williams KA, Petronis J, Smith D, Goodrich D, Wu J, et al. (2005) Effect of Iyengar yoga therapy for chronic low back pain. Pain 115:107-117. Galantino ML, Bzdewka TM, Eissler-Russo JL, Holbrook ML, Mogck EP, et al. (2004) The impact of modified Hatha yoga on chronic low back pain: a pilot study. Altern Ther Health Med 10:56-59. Cox H, Tilbrook H, Aplin J, Semlyen A, Torgerson D, et al. (2010) A randomised controlled trial of yoga for the treatment of chronic low back pain: results of a pilot study. Complement Ther Clin Pract 16:187-193. Borenstein M, Hedges LV, Higgins J, Rothstein HR (2009) Introduction to Meta-Analysis. Wiley, West Sussex (UK). Cohen J (1988) Statistical Power Analysis for the Behavioral Sciences. 2nd Edition, Lawrence Erlbaum Associates, Hillsdale (NJ). Duval S (2005) The trim and fill method. In: Rothstein HR, Sutton AJ, Borenstein M, editors (2005) Publication Bias in Meta-Analysis. Wiley, West Sussex (UK). Hagg O, Fritzell P, Ordwall A (2003) The clinical importance of changes in outcome scores after treatment for chronic low back pain. Eur Spine J 12:12-20. Evans DD, Carter M, Panico R, Kimble L, Morlock JT, et al. (2010) Characteristics and predictors of short-term outcomes in individuals self-selecting yoga or physical therapy for treatment of chronic low back pain. PMR 2:1006-1015.